Preparation is everything! 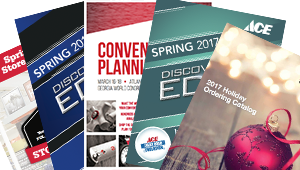 Ace has made it easier than ever to preview and plan for all the great deals and programs you’ll see at the Spring show in Atlanta. Each book is packed with useful product, program and incentive information. From Power Buys and Best Brands to 40 Discovery Edge L1 and L2 deals, you’ll know what to look for before you touch down in Atlanta. The nine convention catalogs listed below are coming soon to your mailbox. Stores should receive hardcopy books beginning February 23 through March 6. Can’t wait? You can download the PDF catalogs and start planning your buying strategy right now! If you don’t have your badges yet, register now. The deadline to register for the Ace 2017 Spring Convention & Exhibits is Friday, March 10. We look forward to seeing you March 16­–18 in Atlanta!